Architecture that embodies a country's values can help improve communication between feuding nations, says Jean Nouvel as the National Museum of Qatar opens in Doha. Nouvel claims the building, which he described as "a representation of a nation", could help to resolve the ongoing diplomatic crisis affecting Qatar's relationship with the surrounding countries. "Architecture and culture is a good way to create communication and understanding between civilisations and countries," said Pritzker Prize-winner Nouvel. Jean Nouvel said the National Museum of Qatar is "a representation of a nation"
"I hope we will develop cultural contact and common works to have a better understanding between the different countries and political attitudes, because I think architecture at this scale is a testimony of an epoch," Nouvel said. The completion of the National Museum of Qatar represents a significant moment in a rapidly evolving gulf state's ongoing effort to fulfil the cultural goals laid out in its 2030 National Vision. The building joins IM Pei's Museum of Islamic Art as one of the main cultural sites developed in recent years by Qatar Museums, which is responsible for promoting heritage and creativity in the country. Designing the museum building was a big responsibility, said Nouvel, as it needed to reflect both the country's aspirations and recent rapid evolution, as well as its ties to the desert landscape and sea that have defined life on this peninsula for millennia. "When you build a national museum it is a representation of a nation, so for this reason you have to make a building with a lot of dignity, you have to respect the image of the country's culture," he pointed out. Nouvel's studio created a building that takes as its starting point a mineral formation called the "desert rose", which occurs naturally in the region's sandy soil. The building's scale and complexity provided the necessary impact to demonstrate Qatar's emergence as a modern nation with technological capabilities to match much more established countries, said Nouvel. Ateliers Jean Nouvel has been active in Doha for over a decade and previously designed a high-rise office tower there that was completed in 2012. 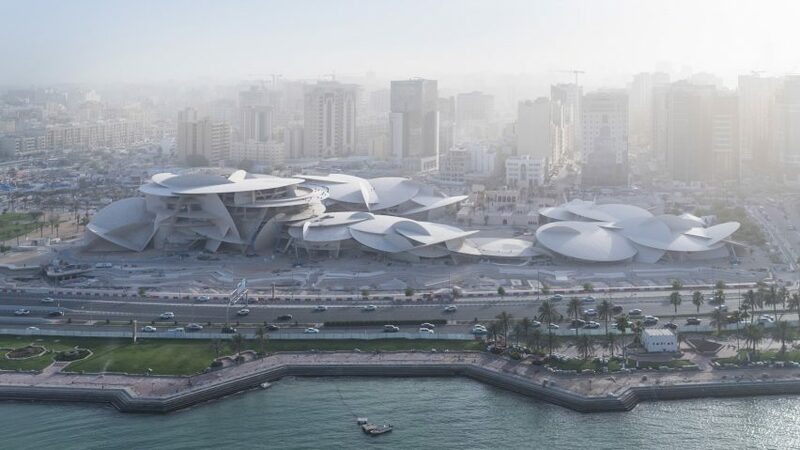 The gulf state has also commissioned many of the world's leading architects to work on projects in and around Doha, with UNStudio designing a new public transportation network and OMA responsible for the angular Qatar National Library building. The museum is designed to "respect the image of the country"
"Qatar is like a laboratory of architecture"
Nouvel said that working in Qatar offers great opportunities for architects but added that, like many nations that have become suddenly wealthy after discovering natural resources such as oil or gas, there is a risk of a homogenous architecture dominating as a result of people "parachuting in buildings that are all the same". "Qatar is like a laboratory of architecture," he suggested, "and a lot of people came here to do projects, like Zaha [Hadid], OMA, [Arata] Isozaki." "On the other side, architecture as a field is being reduced because you have a lot of corporate architecture arriving [here] like in every city in the world, without relationship to culture or climate," Nouvel added. "Architecture is linked to emotion, it's an art for me. I think it’s important to keep architecture in the field of art."